Raccoon Repellent: If you are wondering how to repel raccoons which are invading your trashcans or even your homes then you need not worry as you actually have plenty of options. There are what you call preventative measures which will stop them from visiting your homes in the first place and there are also elimination processes which will help remove them if they are already present. Although raccoons may seem cute and cuddly, you may not really want them to be around your homes. They destroy building materials such as insulation, fascia boards, and even shingles or they can spread around disease through their urine and faeces. There are a variety of products that can help repel raccoons effectively ranging from specially designed spray repellents to ultrasonic devices that will help keep them away for good. The right choice will always depend on what your needs really are. When choosing what repels raccoons, you may need to consider the following factors: the degree of raccoon infestation, whether you will be using it outside or inside of your home, the cost of the product, possible side effects, as well as the type of effect and materials used in the product. You may not be agreeable with some of the ingredients in the products so make sure to check them before you buy. So here are some of the best options on how to repel raccoons that you can find in the market. The Deluxe Squirrel-Raccoon Stopper is another top seller in Amazon with a lot of satisfied customer overall. It is a deflector designed mainly for bird feeders suspended from poles. Raccoons are well known for eating anything and this includes the seeds that you intend for birds. If you had been dealing with this problem then this product may be the answer for your needs. This cone-shaped deflector is made from solid stainless that is coated with the company’s “Extra Slip Agent” which makes it harder for small animals to cling to it. Aside from that, it is designed to tip over if animals try to sit on top of it. The product comes with a coupler that is specially designed to maintain the tipping action of the deflector. It can fit poles from ½ to 1 inch which are commonly used for birdfeeders. Attaching the deflector itself is quite easy by the interlocking edges of the cone. The cone shape of the deflector makes it difficult for raccoons to get from the bottom to the top of the pole and vice versa. 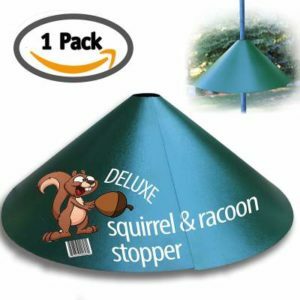 The Deluxe Squirrel-Raccoon Stopper is a very simple yet effective device that will help you prevent raccoons from getting into animal feeds hanging from poles. It is also very affordable and yet durable that it can withstand different types of weather. If you are looking for a simple contraption to accomplish this goal, this is definitely one of the best products that you can find. Natural Armor’s Repellent Spray for Rodents & Animals is one of the best natural raccoon repellent products in the market. It contains zero chemicals and is definitely biodegradable so you don’t have to worry about applying it to vegetable or fruit plants. If you want a 100% safe raccoon repellent, this is definitely the one for you. This Repellent Spray for Rodents & Animals works by giving off scent which is known to be undesirable to raccoons. The ingredients contain garlic, mint oil, bone meal, putrescent whole egg solids, safflower oil, and other items which raccoons do not like. You don’t have to worry about the scent however, as it comes in different scents such as peppermint, thyme, rosemary, and mint. It comes with a comfortable sprayer so applying it is a breeze. It can be used both indoors and outdoors and can cover up to 1,000 square feet of area. You don’t have to apply it often as the scent is so concentrated it can last up to 90 days if it is not washed off by rain. Just spray directly on the leaves and stems of the plant to keep animals away. If you do not like the idea of finding dead raccoons in unexpected areas or being startled by loud noises just to get these animals out of your yard or your home, then the Natural Armor Repellent Spray for Rodents & Animals is the easiest and safest option that you can get. Exterminator’s Choice is a company of professional pest exterminators and their products, such as Rodent Defense Small Animal All Natural Deterrent and Repellent Spray, is guaranteed to give you results while using raccoon repellent plants products as ingredients. This product works by giving raccoons undesirable tastes and smells. Its active ingredients include garlic oil, peppermint oil, rosemary oil, and white pepper. With a water and vinegar base, it is definitely safe to use even with your pets around. It is not toxic so you don’t have to get rid of dead raccoons after using it. To use, simply spray a barrier around areas where you do not want the raccoons to get into. You can use it both indoors and outdoors without affecting its repelling capability. This product also works against other small animals such as rabbits, mice, and squirrels so you get additional benefits by using it. 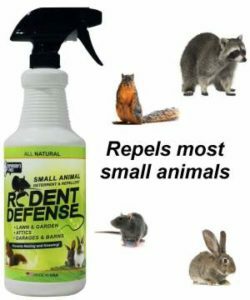 The Rodent Defense Small Animal All Natural Deterrent and Repellent Spray is a great option for those who are looking for a safe yet effective way of keeping raccoons from invading their lawns or homes. One application is good for 30 days and with its very affordable cost, it is definitely one of the most cost-effective methods that you can find. 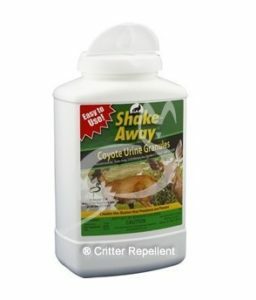 The Shake-Away All Natural Deer & Large Animal Repellent (Coyote Urine Granules) is a natural raccoon repellent which works by simply making the raccoon think that there are natural predators in the area where you sprinkle it. It is one of the most convenient and effective measures that you can use for your lawns or gardens. This product makes use of coyote urine in order to signal to other animals the presence of this natural predator. The granules consist of limestone and crystalline silica which are infused with coyote urine turning it into time-release capsules that release the scent over a period of time. During the first two weeks, you will need to use it twice a week and then once a week after that. Although this is mainly used for deer, it also works for raccoons and armadillo. You can use it for your yards, gardens, or flowerbeds but not indoors. It can cover up to 1,600 square feet of area and can last up to 6 weeks if used properly. Some users reported that it gives off an unpleasant scent but that is what exactly makes this product effective. Aside from that, it is for outdoor use and not inside your home. Overall, if you want an affordable and natural repellent for raccoons, this is definitely one of the best products in the market. 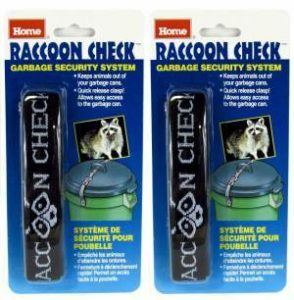 The Raccoon Check Garbage Can Security System (Pack of 2) is a more physical method of preventing raccoons from getting to one of their most favourite items in your home – garbage. Although they are wildlife and are supposed to eat natural foods, most of them have taken into eating anything that is in your trash bin. This product prevents raccoon infestation by locking in the lids of your garbage can. You need to drill holes into the lid, and install the nylon belt, as well as into the sides of the bin if you want a more secure locking mechanism. It has a clasp that is hard to open unless you have push on the quick-release buckle which is quite impossible for raccoons to do. It comes complete with the nuts and bolts that you may need, a durable nylon strap with buckles, and instructional guide on how to use it. Although it does require some muscle work, it definitely secures the lid of your garbage bin that raccoons can in no way open it. The strap can work with garbage cans with a diameter of 16 to 30 inches so it can fit quite well with any standard bin. It is also definitely more affordable than any other raccoon repellent products that you can find in the market. 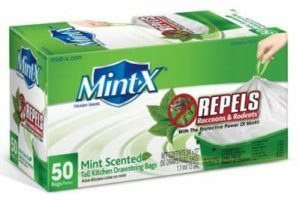 Mint-X is the only company in the US which has an EPA registered rodent repellent trash bag and this includes the Mint-X Rodent Repellent Tall Kitchen Trash Bags, 13 gal. capacity. Each box contains 50 bags which is enough to last you for a month or even more. This product basically works by incorporating essential oils which are known to repel raccoons in the plastic itself. These include camphor oil, eucalyptus oil, methyl salicylate, and corn mint oil which are mixed into the plastic during the extrusion process. The scent as well as the taste will help deter this animals from trashing your garbage bins. Each bag is large enough to accommodate a significant amount of garbage so you don’t really have to use multiple bags per day. You will also notice that it only as a mild mint scent compared to others which have a strong unpleasant smell. Using these bags will be great together with other methods in order to totally eliminate raccoon infestation in your home. Overall, this bag is a great method of preventing raccoons from raiding your garbage. Its scent as well as its taste, help deter these animals without posing health and environmental risks for your family. At its cost, it is definitely offers great value for its purpose. When buying raccoon repellent products, you basically have to choose between those that are natural based or are artificially produced. There are advantages and disadvantages to both of these types of repellents so you may have to really choose carefully as to which to use. If you want a fast and effective way to deal with raccoons then artificial methods may seem attractive at first. You can definitely see instant results as the raccoons stay away from the area quite visibly. But then, the problem is once you remove the repellent, they will start coming back. On the other hand, natural repellents work in a slow yet effective manner in letting the animal know that it is not welcome in your garden or in your home. Natural raccoon repellents work by appealing to the inherent dislikes or fear of the animal gradually. What is also great about it is that it does not pose any health or environmental risks at all. Safety – How safe is it to use the product especially around other pets or small children? Ultrasonic raccoon repellents are often not recommended inside the home due to its negative effect on other small animals. On the other hand, natural raccoon repellents are often composed of food-grade ingredients which make it safe even for little children. Area Covered – If you have a large area that has to be treated, then you need to opt for products that can cover that size. For example, there are sprays which can be diluted so you can use it for a thousand square feet while there are others that are only good for spot treatments. Effectiveness – There are products which are mainly for outdoor use while there are others that can be used both indoors and outdoors. Make sure to read the instructions in order to get the most out of the product. Also, you need to keep in mind that there are products that need reapplication after a rainy day. Ultrasonic sounds are also muffled out by other objects such as walls and curtains so make sure they are not obstructed. Costs – It makes good sense that more expensive products should be able to give you results for much longer. So check the length of time which a product is effective and also whether or not it has a warranty in case you are not satisfied with it.